Dr James Connolly (UCL) ‘The experience of occupation in the Nord, 1914-18’ in discussion with Professor Alison Fell (Leeds) and Professor Heather Jones (UCL). Chair: Dr Ludivine Broch. From 1914 to 1918, ten departments in Northern France were occupied in part or in full by the Germans. A total of 2.15 million people were trapped behind enemy lines living on German time, with strict curfews and almost no communications with the rest of France. Conditions were so difficult that international aid was necessary to provide food and goods to these people. At one point, 20,000 men and women from Lille were kidnapped, deported to the Ardennes to work in fields. This is the standard narrative of the occupation of Northern France during the First World War. Although it is much less known than the Occupation’ of 1940-44, it is wrapped in a familiar discourse of suffering and martyrdom. 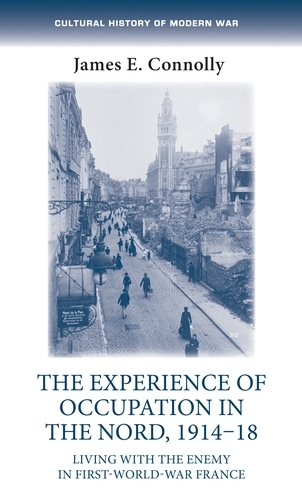 In his fascinating book, The Experience of Occupation in the Nord, 1914-18: Living with the Enemy in First World War France (MUP, 2018), James Connolly goes beyond this story of suffering. Focussing on the Nord department – with a large population and highly urbanised areas around Lille, Roubaix and Tourcoing – he has carried out a socio-cultural history of attitudes, reactions and ways of life to reveal stories of complicity, disunity, resistance and memory during the occupation of Northern France. As (totalising) war raged on, the everyday needs, lives and experiences of the ‘boches du nord’ highlight the ‘culture de l’occupé’. From fascinating postcards and images showing misconduct and symbolic resistance to accounts of criminality, Connolly offered in his discussion of vibrant account of everyday life in this occupied area. 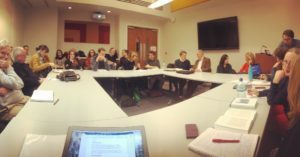 But more than that, as Heather Jones pointed out, he gives us extremely useful terms such as misconduct, culture of the occupied or respectability, which allow us to redefine a period still dominated by myths of suffering. The ‘messiness’ of war comes to the surface. Furthermore, as Alison Fell emphasised, the role of gender runs throughout his book. If war allows women’s lives to become even more invaded and controlled, Connolly showed how occupation clearly added its own layers of restriction, surveillance and judgement.